William Rodber was born in Odcombe around 1885, the son of sawyer William Rodber and his wife Mary Ann, a glover. Sadly William Rodber Snr died, aged 37, the year after his son's birth and Mary Rodber was left to bring up her family alone. In the 1891 census Mary and all her four daughters; Kate, Bessie, Ellen and Sarah were listed as glovers and living at Higher Odcombe. 6-year old William was listed as a scholar. By 1901 Mary and William had moved to Yeovil and were living at 83 Huish. Mary gave her occupations a Monthly Nurse, while her son William gave his as a China Dealer's Porter and was later working at the Tallow Chandler and Wholesale Grocery company of J Thompsett & Co at the Candle Factory in West Hendford, on the corner of Salthouse Lane. In the summer of 1908 William married Nellie Rowsell of South Petherton at Yeovil. William and Nellie set up home at 26 Huish and in 1909 had a daughter Madge. In the 1911 census William gave his occupation as a 'Porter in Shop' while Nellie gave hers as a Glove Machinist. Later that year they had another daughter, Evelyn. Later still William and Nellie moved around the corner to live in Wellington Street. In March 1917, at Yeovil, William enlisted in 'C' Company of the 1st Battalion, Somerset Light Infantry (Service No 203771) and was sent to France in June 1917 and fought almost continuously for the next year in the following battles. In 1918 the 1st Battalion saw action on the Somme, then returned to Flanders fighting in the Defence of Hinges Ridge during the Battle of Hazebrouck and in the Battle of Bethune, the Advance in Flanders, the Battles of the Hindenburg Line and the Final Advance in Picardy. William fought in the Battle of the Selle (17-26 October 1918), one of the final battles of the war. After a six-day halt for preparations and artillery bombardments Fourth Army troops attacked at 5.20am on Thursday 17 October; infantry and tanks, preceded by a creeping barrage, moved forward on a ten mile wide front south of Le Cateau. The centre and left of the Fourth Army forced crossings of the river despite unexpectedly strong German resistance and much uncut barbed wire. Fighting was particularly fierce along the line of the Le Cateau – Wassigny railway. The right of the attack, across the upland watershed of the Selle, made most progress and by nightfall enemy defences had been broken and Le Cateau captured. Severe fighting continued on 18 and 19 October, by which time Fourth Army advanced over five miles, harrying the Germans back towards the Sambre-Oise Canal. The British Third and First Armies, immediately to the north of Fourth Army, maintained the offensive pressure the following day. In a surprise joint night attack in the early morning of 20 October Third Army formations secured the high ground east of the Selle. Following a two day pause, to bring up heavy artillery, the attack was renewed on 23 October with a major combined assault by Fourth, Third and First Armies; the fighting, which continued into the next day, resulted in further advances. At this stage, the German Army was retreating at a forced but controlled pace. On 24 October, the German Army counterattacked at the Canal de la Derivation, but were repulsed and pushed back by the Belgian Army. William Rodber was shot in the head during the battle and died in hospital from his wounds on 26 October 1918. He was aged 32. On 8 November 1918 the Western Gazette reported "Private Wm. Rodber, Somerset LI, whose home is at Wellington Street, Huish, died at a South African General Hospital, France, on the 26th ult., from gunshot wounds in the head. The late Private Rodber joined the Army in March 1917 and was drafted to France the following June. He was home on leave about two months ago. Previous to joining the Army the deceased was employed by Messrs. J Thompsett & Co, West Hendford, and was held in high esteem by a wide circle of friends in Yeovil and district. He leaves a widow and two children." After his death Nellie and the children moved back to her home town of South Petherton. William was interred at Abbeville Communal Cemetery Extension, Somme, France, Grave IV.J.13, and his name is recorded on the War Memorial in the Borough. 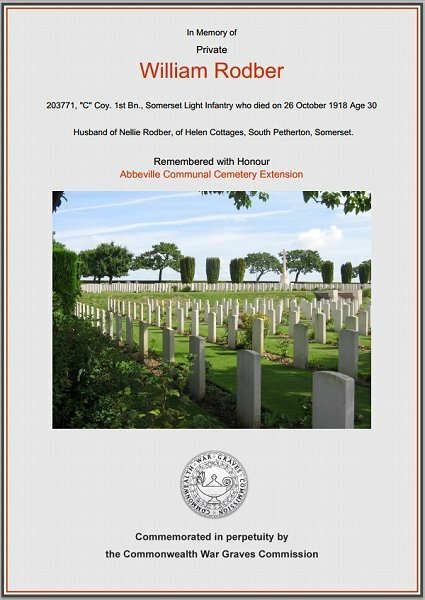 The Commonwealth War Graves Commission certificate in memory of William Rodber.